Property 5: Superb 18th century farmhouse, in the heart of the vineyard. Property 20: Duplex apartment in a wine village, 5 pers. 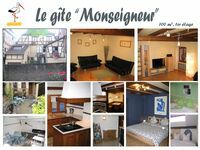 Property 33: Apartment "The MAIA"
Property 37: Cottage Petit Rempart 4pers. This was our first visit ever to Obernai, and we were delighted to have found this apartment on HomeAway. The apartment is just as pictured &amp; is perfectly located to walk everywhere - we loved it! The balcony is wonderful, too - we enjoyed a glass of wine at the end of each day and coffee every morning outside. (And yes, we were lucky to have such nice weather!) The hosts are wonderful - very inviting &amp; informative. They gave us great restaurant recommendations as well as suggestions for sightseeing in Obernai and along the Route des Vins d'Alsace. There is a great 15-20 minute walk around the ramparts of the town -it's slightly elevated and gives one a really nice feel for the old town. We found Obernai to be warm, friendly, &amp; very lively - we only wished that we had booked a longer stay!! Thank you, Fabienne &amp; Laurent, for sharing your wonderful apartment with visitors! !